"This soup is outstanding and a wonderful use of ground venison or elk, which is much better for you than ground beef. It also uses some veggies that we don't use very often, if ever! Here, it all comes together deliciously." Brown venison and onions in a large pot over medium heat. 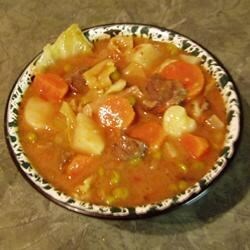 Mix in onion, parsnip, potatoes, carrots, rutabagas, tomatoes, bouillon, water, cabbage, bay leaf, oregano, salt and pepper. Bring to a boil, reduce heat to low and simmer 1 to 2 hours. This is a great recipe, but if you want to make a truly "excellent" venison soup try making it with venison mixed with hot italian sausage. It's simply awesome! If I were to make this again, I would use 1/2 the meat, double the tomatoes and add frozen green peas at the end. First time I ever had parsnips - they were good and added to the overall flavor. This was very good. I accidently bought a turnip instead of the rutabaga :) but my entire family thought it was terrific and had seconds and even thirds. Awesome soup. I have made this soup many times. At times I have substituted vegetables with others I already have in the house. It always turns out great. Over all a good flavor to this soup ,but I added more 2 more cups of water and 2 more boullion cubes ,1 cup tomato juice. To give it more liquid,could have used even more of both. Definitely different from your normal venison recipes. Unique combination of flavors. Very good recipe that got better each day.